I never realized how amazing Columbus is until last summer when I tried to see Shakespeare in the Park in Cincinnati. 2) It would be performed entirely in a tiny pavilion with no stage and limited scenery. 3) It ended up getting canceled, anyway, due to lightning in the area. 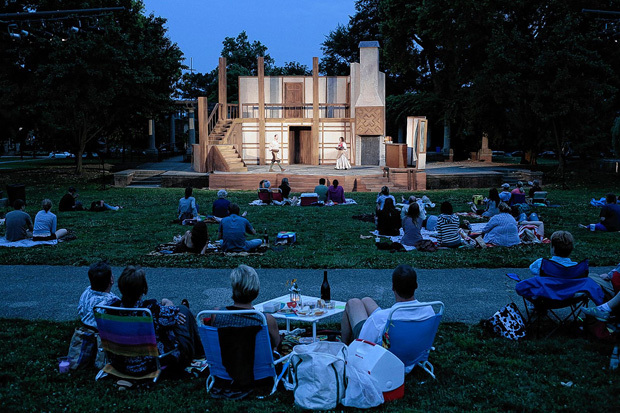 We were disappointed that we didn’t get to see the play, but honestly we’d been spoiled by Columbus’ amazing Shakespeare in the Park program at Schiller, and I suspect that the Cincinnati version would have disappointed. That same summer (last summer) Actors’ Theatre did Hamlet and the Merry Wives of Windsor. Two really, really different plays, but we loved them both. This Saturday we’re going to see Captain Blood – not Shakespeare, but it’s got pirates! And we’ll be going to Katzinger’s for our traditional Schiller Park picnic before the play. And we know we’ll see a great show in a beautiful park on a massive stage. Later in the summer they’ll be doing Richard III. If you’ve never been – or even if you have – you should check it out. Plays at Schiller are one of the things that make Columbus, well, pretty great. I’ve changed the name of my blog because I love the idea of a symphony, a harmonious blending of different elements to create something beautiful. I started this blog as a celebration of science, sea turtles, and a sense of wonder. I still celebrate all those, but I want to write about so much more. I want to write about Shakespeare, and music, and art, and poetry, and love, and people. Amazing, amazing people. I once wrote here that I hate fiction. Now I realize that it wasn’t fiction I hated at all. It was bad fiction. I felt like I didn’t have a way to argue against bad fiction. But of course that was never true. The argument against bad fiction is to celebrate good fiction. I’m reading more fiction than ever before. Shakespeare, yes. But also Faulkner, and Hemingway, and Pynchon, and Emily Dickinson and Jane Austen and Thomas Hardy and . . . and I’ll write about them here. I’ll still write about science, too. I’m still in love with science, because it’s one of the things people do. Amazing, amazing people. When you’re in love, you want to tell the world. So I will.